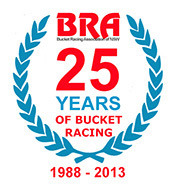 Round four of the PCRA BRA Bucket championship is done and dusted. Past the championship's half way mark some of the five BRA Classes look settled (it ain't over till it's over though) but others will go down to the wire. 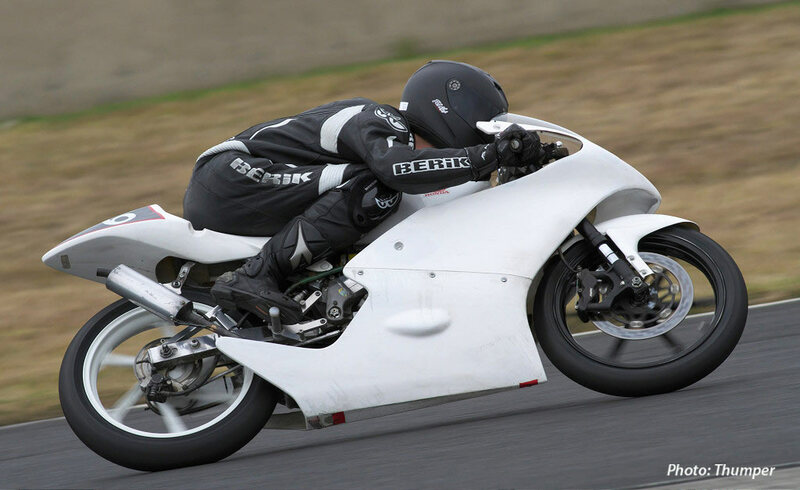 Round four was run on the full GP Gardner circuit and despite the cold and windy conditions the racing was close and exciting in all the Bucket classes. Qualifying set the scene for the days racing. Motolites it was #6 Jason Dunn (Honda RS85cr) ahead of #77 Tyler Bradford (BBE CBR150) and #86 Anthony Marsden (Chris Sculley Honda RS85cr). Superlite Pro was headed up by #38 Junior Murphy (BBE Honda CB150) from #169 Ian Gregory (Honda CB150) and #65 Tim Smith (Honda CB150). 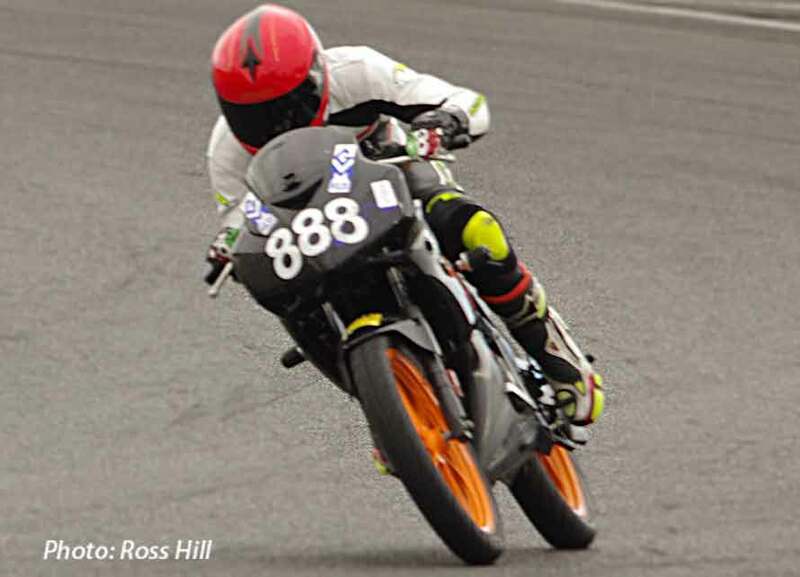 Commuterlite Pro saw #48 Nicolas Wenban (Honda CBR125) lead #888 Jack Robinson (CBR125) by a comfortable margin with #136 Ron Pulido(CBR125) next. 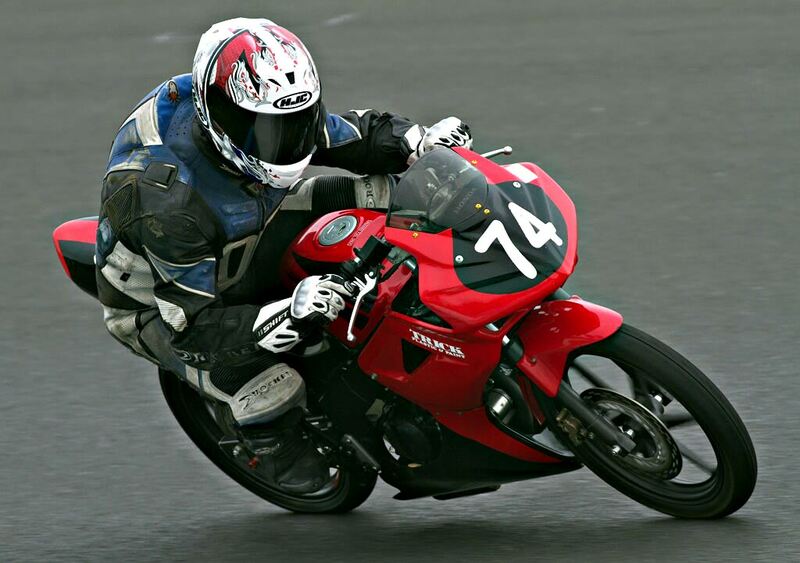 Commuterlite AM pole was separated by a whisker with #40 Richard Cook (Honda CBR125) just squeezing in before Jason Blanch (CBR125) who was followed by #17 Adam Cameron (Honda CBR125). Jason Dunn is back and how! 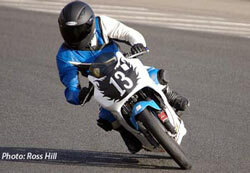 Tyler Bradford's run of wins came to end with the return of Jason who dominated the Motolite class with 2 convincing wins. #6 Jason Dunn (Honda RS85cr) led race 1 flag to flag reeling off several laps under the 2 minute mark. #77 Tyler Bradford (BBE CBR150) seemed to have trouble getting away but quickly slotted into 2nd place. Another rider to make a slow start #86 Anthony Marsden (Chris Sculley Honda RS85cr) had #14 Ken Lawrence (Honda RS150CBR) and #68 Shane Wilcox (Sculley Honda RS85cr) come past but it took Anthony only a lap to get back to 3rd but there he stayed as Jason and Tyler were well away. 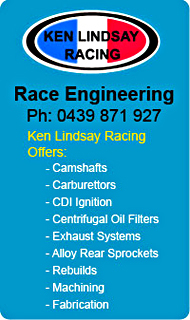 #14 Ken Lawrence had to retire his overheating RS150 due to a blown water pump seal which was fixed for race 2. Number 28 Jack McGauley (Honda RS85cr) passed #68 Shane Wilcox on the last lap to take 4th. place. Next up #96 Jeff Brown (BBE YamahaYFZR150) was followed home by #94 John Olip (Moriwaki 85) having an excellent comeback ride since his big off at the first round at Wakefield Park. 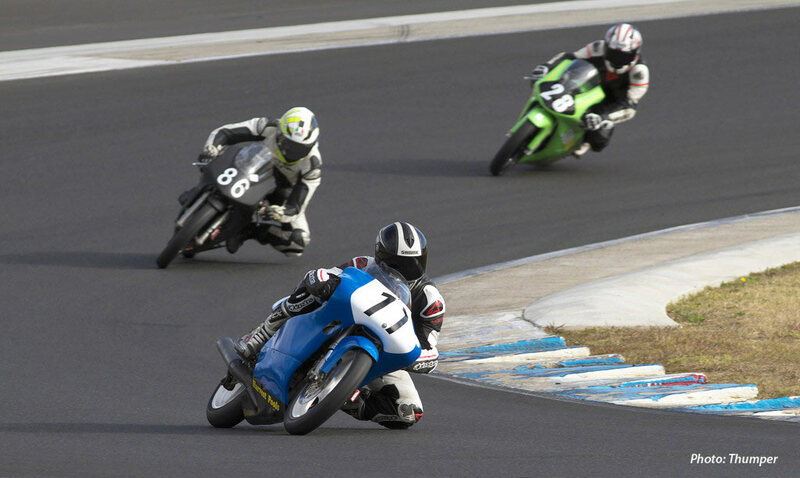 The top 10 was rounded out by #80 Colin Berry(Supermono150) , #22 Jeff Angel(Moriwaki80) and #63 Bob Murphy (Honda 200). Again the finishing order of the first four was the same as race one. 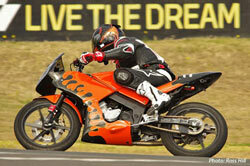 This time a relieved Ken Lawrence (Honda RS150CBR) kept going to finish 5th. Another non finisher in race one #32 Marty McGauley (Honda CR85) came 6th. Next up was #94 John Olip, #96 Jeff Brown, #80 Colin Berry and in 10th place #18 Brian Mowle (Honda CBR150) another first race retirement enjoying a good 2nd race. Number 169 Ian Gregory (Honda CB150) and #38 Junior Murphy (BBE Honda CB150) resumed their battle from the previous meetings. From the start #38 Junior led the race with #169 Ian playing a waiting game snapping at Juniors rear wheel. Last lap final corner Ian pounced and got the win by a whisker in a wheel to wheel dash to the finish line. 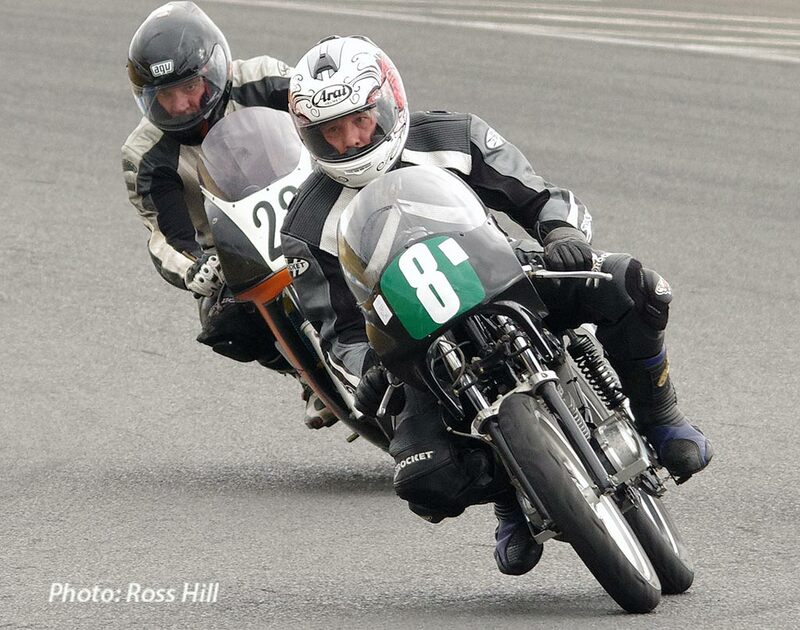 After missing a few meetings #50 Fred Holland(Honda CB150) showed he was back in form with a strong 3rd.place. 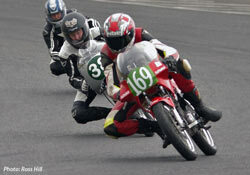 #65 Tim Smith came in 4th with #2 Ken Lindsay (KLR Honda RCB150) next. End of Lap 1 saw #169 Ian Gregory ahead of #50 Fred Holland and #38 Junior Murphy 3rd who had made a poor start. In the next 2 laps Junior pulled back the deficit and had the lead going into the last lap. All to avail as on turn 9 an off track excursion had Ian slip past to take another win to end up winner for the day. #50 Fred Holland came 3rd with #65 Tim Smith next followed by #2 Ken Lindsay. Number 81 Robert Tisdell (Honda CB150) got a flyer of a start whereas #8 Kurt Wagus (BBE Honda CB150) had a poor start and fell down the order into the clutches of the Commuterlite hordes. However Kurt recovered breaking clear of the CommuterLites and passing Robert on the last lap for a hard fought win. Number 181 Glenn Tisdell (Suzuki150) finished 3rd, #62 Jim Murphy (BBE Honda CB150) 4th. #31 Duncan Taylor (Kawasaki KH100) 5th. 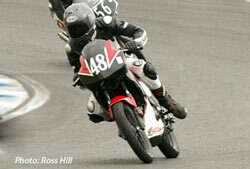 and #164 Darrell Francis(Honda CB150) 6th. This time Kurt Wagus made no mistake at the start leading the Superlite AM flag to flag. Robert Tisdell came home 2nd with Glenn Tisdell 3rd, Jim Murphy 4th. and Duncan Taylor on the lone Kawasaki 5th. Darrell Francis and Anthony Bilston didn't finish race 2. 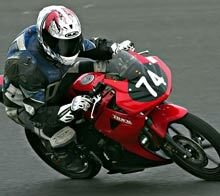 Anthony had arrived with a newly acquired Suzuki 150 and was disappointed not to finish either race. Some teething problems to be sorted out. Number 48 Nicolas Wenban (Honda CBR125) won race one after a fantastic race with #888 Jack Robinson (CBR125). These two were swapping places each lap with Nicolas getting the verdict by a small margin. 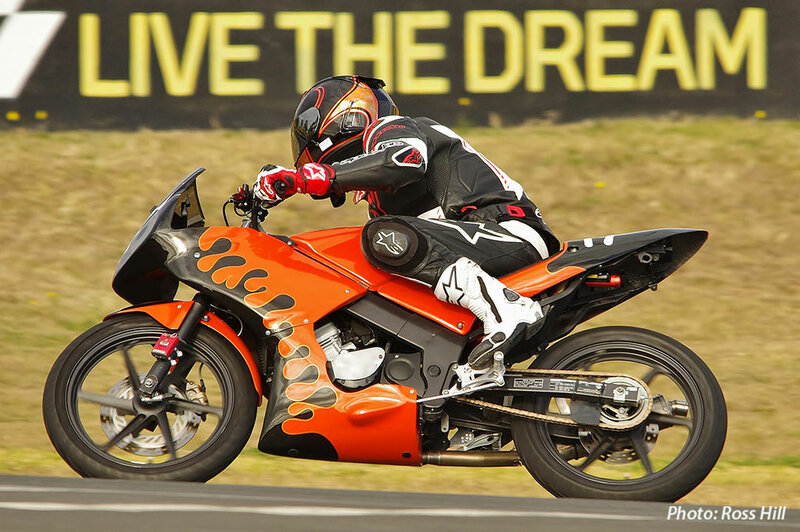 Number 136 Ron Pulido(CBR125) Pro championship leader kept himself in the hunt with a strong 3rd place. Next up came #16 Robert Young on the KTM125 ) followed home by Sugar Plum Racings 67 Richard Draper (CBR125). 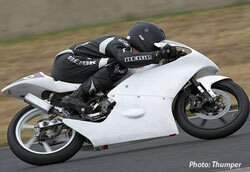 Both Jack Robinson and Ron Pulido made poor starts in race two allowing Nicolas Wenban to win as he pleased. Both Jack and Ron Pulido recovered well in the last lap to finish 2nd and 3rd in the same order as race one. 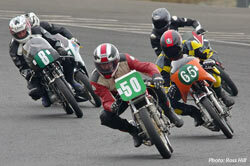 Next up came Sugar Plum Racings 67 Richard Draper followed home by #16 Robert Young (KTM125). Ron Pulido leads the Commuterlite Pro championship by 8 points from Jack Robinson with the on form Nicolas Wenban up to 3rd but he is 33 Points behind. the leader. 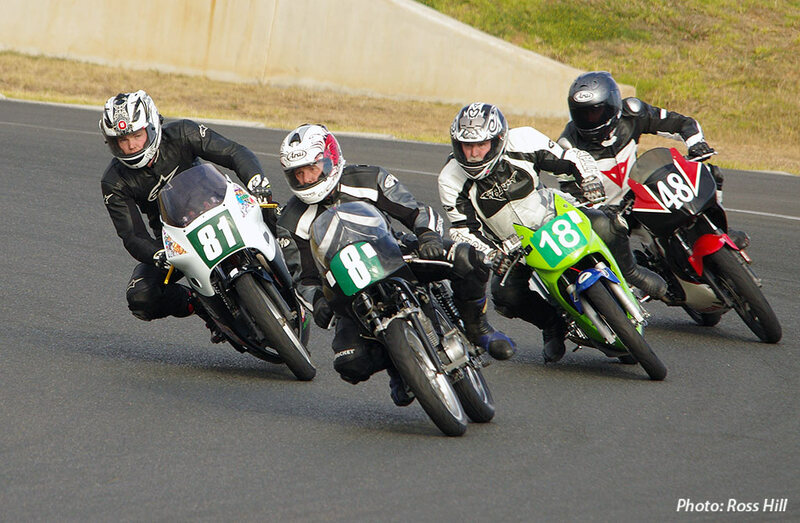 The early order was #10 Jason Blanch (CBR125), #17 Adam Cameron (Honda CBR125) #73 Oliver Higgins (CBR125), #555 Nicholas Miller (Honda CBR125) and #104 Ron Winban (CBR125) with #13 Andrew Martin (Honda CBR125) hanging on. This bunch of riders were swapping places every corner showing what Commuterlite racing is all about, great racing and a lot of fun. At the chequered flag the order was #17 Adam Cameron, 104 Ron Wenban, 73 Oliver Higgins, 10 Jason blanch, 555 Nicholas Miller. Number 13 Andrew Martin was on fire in race 2 climbing through the field to take the win by 2 tenths at the flag from race one winner 17 Adam Cameron. Number 73 Oliver finished a close 3rd. followed by 28 Ron Wenban, 40 Richard Cook and newcomer 82 Corey Smith having a great first meeting with a 7th in race one and 6th in race two in amongst some intense racers.